Five years ago, young Egyptian fashion designer Fayza Ahmed launched Fayroza in what is now a thriving Cairo fashion scene. Combining casual wear with an oriental touch, Fayroza's inspiration is multi-faceted. The collections are influenced by ancient Egyptian designs and motifs, modern contemporary arts and culture as well as Islamic art and architecture. To that the young designer adds traditional Malawian arts, arabesque, geometrical patterns, calligraphy, letter embroidery shapes and drawings. Ahmed, who exports abroad to Dubai, Jordan and Saudi Arabia, says that she was also influenced by the cultural heritage of India, Afghanistan and Turkey. “I love anything handmade and anything made with love. I always like to wear outfits that look different and unique in style [by] mixing and matching clothes together with different colors into one look,” Ahmed explained. She does not depart too far from contemporary mode. “I follow the outline in the latest women’s latest trends in styles, colors, textiles, fabrics and cuts,” Ahmed said. Ahmed presented her latest collection, the seventh so far in her career, just in time for Ramadan 2018. In this collection, she used handmade, printed, and embroidered fabrics made of cotton, viscose, satin crepe, voile, gabardine and chiffon. Her collection opts for cool hues such as light canary yellow, baby blue, purple and variations of olive from light to dark. She also implements bright, vivid colors such as fuchsia, hot pink, deep red and magenta. Ahmed’s collection features a chiffon cape abaya, an open-front abaya, poncho abaya, vest, cardigan, blouses and a maxi dress with long sleeves. 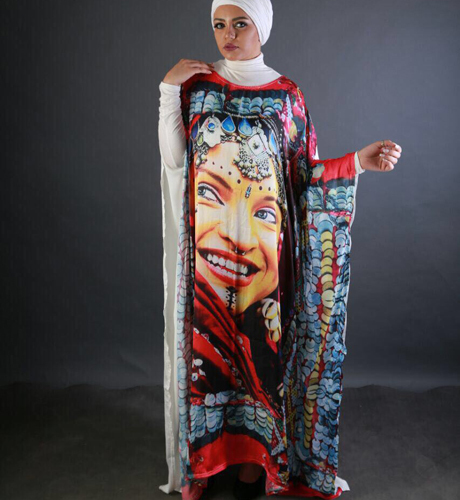 The designer readily implements Egyptian cultural heritage into her costumes, including the traditional garb of the Egyptian peasant farmer, known in Arabic as "falah," and oriental styles of Ramadan décor, including colorful Al-Khayamina fabrics, the likenessess of mosque minarets, the crescent moon and traditional lanterns. Ahmed made many of her designs by Schnitt stitch, "a certain kind of embroidery machine with multiple threads. The stitches form beautiful cashmere floral, square, and circle motifs on the fabrics,” she explained. The young designer also incorporates the Etamin stitching style of the Bedouin in Sinai, as well as Egyptian tally, a handmade embroidery style native to a small village in Egypt's Sohag. She also uses Al-Malas Al-Saidi, a black fabric traditionally used by the women of Upper Egypt, in her casual designs in modern way. Different dressstyles and shapes are very trendy as the feminine look comes back strongly this summer season. According to Ahmed, “The wide-cut is dominant this year, [including] multi-layered and -tiered, long pleated, flared skirts, blouses, sleeves, and dresses. There is misconception that the color white makes you look fuller." "On the contrary, it depends mainly on the choice of dress cut for your body shape,” she concluded.